It shouldn't have come as a surprise to me, but it did. Collecting and listening to Bollywood soundtracks for more than a decade, blogging about them for four years; it wasn't until after I'd completed MFT3F's initial run that I first heard (heard of) what has to be one of RD Burman's greatest songs. Fellow enthusiast and frequent commenter Harshi posted a link to 'I Am Falling In Love' on Facebook, and from the first listen I was awed. It really is an otherworldly track; a haunting, melancholy sounding bossa nova tune; exquisitely arranged (listen to the piano, the percussion, the trumpet solo) and beautifully sung (in English) by the comparatively unknown Ursula Vaz. Midway it segues into a piece of action-packed, jazzy funk-rock; equally amazingly arranged. From start to finish, it is pure perfection. 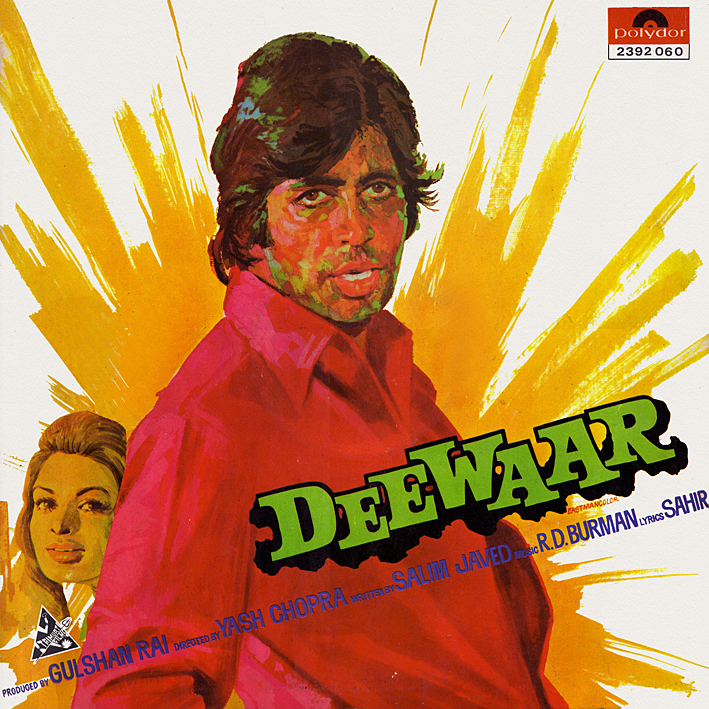 I'd come across copies of 'Deewaar' [review]   before but had never been tempted to buy one. I'd heard it, and didn't find anything on it particularly exciting. What I didn't know at the time was that 'I Am Falling In Love' had been left out of the commonly available LP, in favour of a side's worth of "power packed dialogues". A seemingly ridiculous decision on the record label's part, but for the fact that the song only served as background music to one particular scene in the film. It was included on a limited edition all-music version of the soundtrack, on an equally rare 2xLP set, and (shortened) on an EP, but these are extremely hard to find and always command high prices; beyond my general limits. So I was extremely pleased to obtain a Malaysian pressing of the all-music version (albeit one of dubious legality), still expensive but considerably less so than the Indian. It lacks the original cover art, which I kind of miss, but you can't always have everything. [Update: Now with original cover art.] A superb Burman song, in its full length, and I think in the best quality currently available… more than enough. Hey PC! What a rare find.. did u come across the 2 Lp set anywhere? great to have you back again! thanks. There was a copy of the 2LP on eBay a while back - totally trashed and stupidly priced. Indeed a haunting melody......I used to play it in loop back in the day. Lucky enough to find a copy of the double lp in Mumbai. Also bought the dialog record. Awesome as ever. Bravo PC. A pleasant surprise. the download site is filled with really bad trojans and viruses. Fortunately, I had the software to block it. Which of the download sites? Here is the first print of Deewar including the song. The price is as usual astronomically high. A fairly high price for copies of this would actually be warranted if they weren't in rubbish shape. But they're usually trashed, and as such $300-500 is obscene. No secret, just well taken care of vinyl. Mostly. Super, so glad you found the Ursula song. Love it! Thanks. Ooh! You've outdone yourself. Many thanks! Not a single song of Deewar is more than mediocre. All are below medium class. The music of Deewar and Sholay is below average. Mediocre at best. Erm... ok. A bit harsh that, in my opinion though. And I'll maintain that 'I Am Falling In Love' is superb. is it possible to reupload sir ? Sorry, but no. For further explanation, see the FAQ-page (re. note at the bottom of the comment field).